Hpa-an is located inside the Kayin State and majority of the people living around that region belong to Kayin ethnicity. Before it was founded at 1907 by colonial government, it was just a cluster of 200 houses village. It will takes about seven hours of driving time to reach from Yangon. 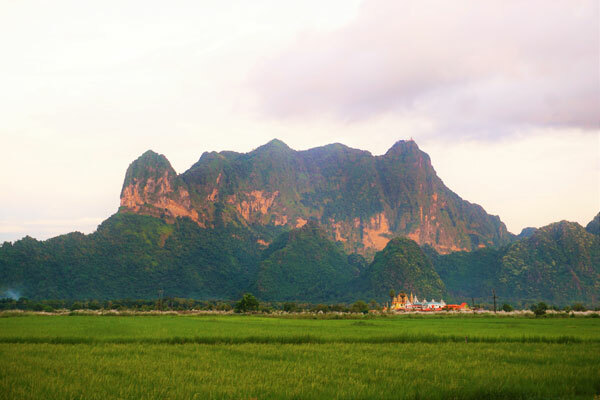 It is famous for its landscape, limestone hills dotted all over the flat land surrounding the Hpa – an town, and its limestone caves of various sizes. (Literal translation will be King’s brother cave)-is located a few kilometers before you reach Hpa-an. There is a hot spring at the base of the hill before you reach the opening of the cave. It is in the middle of the limestone hill and you will have to navigate the stairs to reach the cave. According to the legend, the hot spring was formed by the vow of the hermit who called the cave his abode. He was said to be an exile prince, who took refuge there to avoid the layman life. When he was threatened by a company of soldiers sent by the King of nearby Kingdom who saw the hermit as a threat to his throne, the hermit made a vow to deter the soldiers. The effect of the vow was the hot spring gushing out of the ground and formed a stream, stopping the advance of soldiers. The cave is under the care of nearby monastery and they will turn on the light if you donate money for electricity. 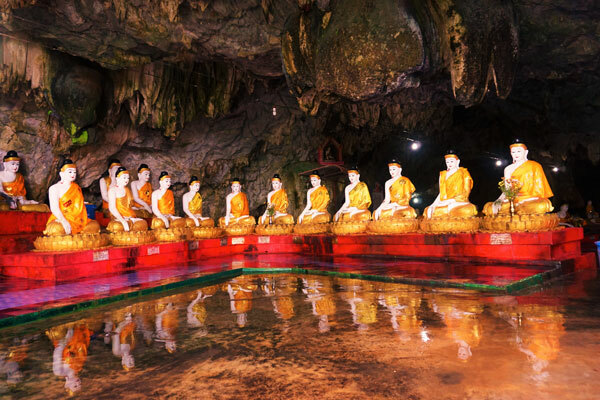 The centuries old Buddhist artworks are the main attraction of the Kawgun cave. 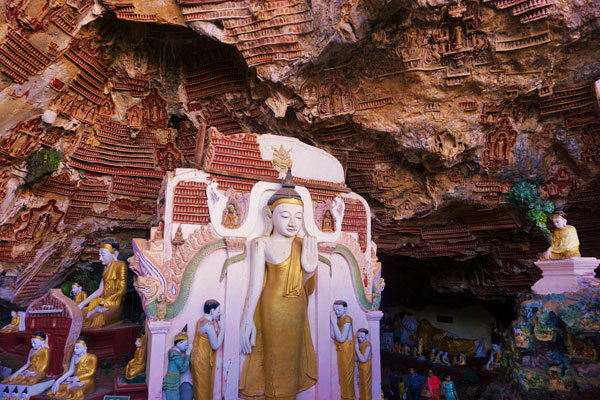 The artworks are the thousands of clay Buddha images plastered to the walls and ceiling of the cave. Archaeological department also discovered other artifacts belong to 9th to 11th century A.D. One is the stone inscription left by a queen of her merits of building Buddha images inside the cave. Yathaypyan cave is about two kilometers distance from Kawgun cave. It is also decorated with Buddha images, big and small. The roof of the cave has an opening from which the hermit, who dwelled inside the cave, flown through after he attained super power from mediation-hence the name Yathaypyan. 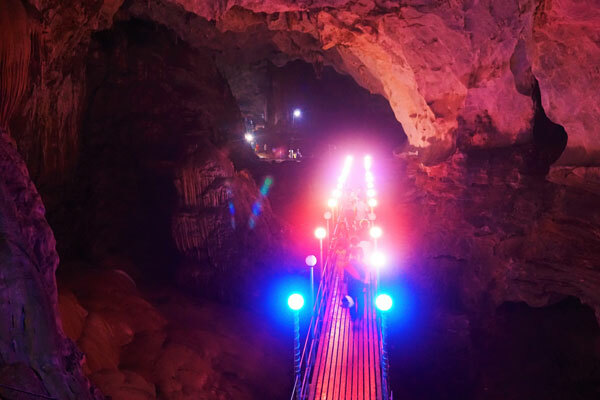 The largest cave near Hpa-an, is the Saddan cave. It is named after an elephant from a Buddhist story. It is a name appropriate for the football-stadium size cave. It is also home for the bats. It will take about fifteen minutes to reach to the other side of the cave. You can take a boat ride through the lake and half flooded cave for a fee when you reach the other side. The boat rower will take you back near to the entrance passing through paddy fields while you enjoy the quiet calls of the nature. This is one of the places to watch sunset whether you’re on ground or elevated position. 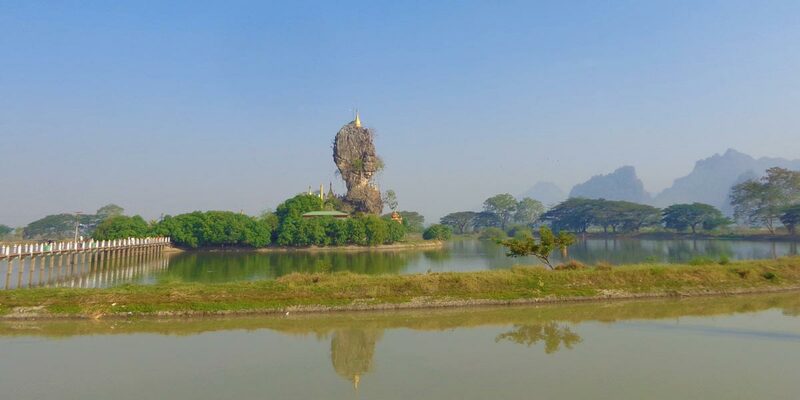 Kyauk Kalat is a limestone formation shaped like a pillar which is located inside a monastic compound and it is surrounded by a man-made lake. You can climb the stairs half-way up the pillar. You can have a blessed string, to ward off evil spirits, from the donation counter operating near the end of stairs if you want. Watch out for the bees for some time they would formed a hive on the surface of the pillar. For the people who like to have a breathtaking panoramic view of Hpa-an surrounding after a breathtaking two hours trekking, Mount Zwegabin is the place to visit. 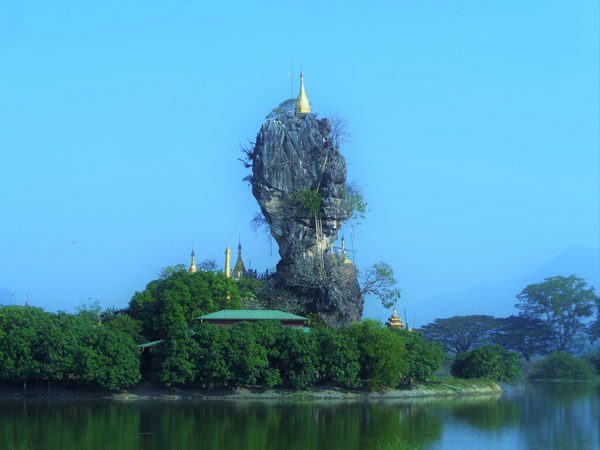 Mount Zwegabin is located about ten kilometers south of Hpa-an. It is the tallest mountain near Hpa-an with a height of 2372 ft (723 m). It is the most famous landmark of Kayin State. It has a monastery and a small stupa at the summit.